2003 - 2005 Toyota Hiace Long Wheel Base, fitted out 2009 -2010. Clubby Camper Van Range are very hi-spec offering more storage room above seats and much greater head room, our fit outs are made from New Zealand Pine wood. It is easy to drive and quick and cheap to hire. Located in Christchurch, New Zealand. Note: Kayaks not available on Clubby Range. The Hippie Drift is an affordable, reliable option for all your touring needs. Equipped with all the essentials, the Hippie Drift features an air conditioned driver's cabin, built-in refrigerator and a huge double bed. You will gladly remember these holidays! Easy to park and great to drive, the Hippie Drift will add some flower-powered fun to your next trip around New Zealand. Vehicle 5 years of age or over. Mitsubishi Express L300. Further discounts apply for NZ and Australian residents, for more details click More Information & scroll down to Special Offers. Not Certified as Self Contained - Cannot Freedom Camp Baby/Booster seats cannot be fitted with this model. Children under 8 years cannot travel in this vehicle. 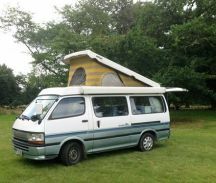 This 1999 Toyota Hiace Hi-Top 3L auto camper with central locking, has a wind out awning that pulls out on the side. Is a long wheel base van (extra room) and has a towbar, 2 seats/seatbelts, 2 Single beds OR double & a porta potti. A solar shower can be hired as an additional cost. This Campervan is certified as self contained. Can freedom camp in designated areas. 1999 Hiace Pop-Top 3L auto camper, Automatic with overdrive - New JVC audio unit, aux, usb, mp3, bluetooth - Canvas vents, windows and insect screens in the pop-up - has a wind out awning that pulls out on the side. Seat belts for 7 facing forward. Has a towbar. Air conditioning (driver) and factory fitted diesel heater. Also has a porta pottie! A solar shower is available for hire NZ$50. Easy to drive, requiring only a standard licence - Sleeps 2 adults down & 1 small person up. For more people to sleep can hire a Tent NZ$50 per hire - Inflatable Mattress NZ$30 per hire. Economically priced, the Pod rental vans are set up so that you will have everything you need to camp. Although campers are not certified self contained, there is a cassette toilet, and a sink with a pump faucet for cold water, a gas cooker, camping chairs & a camping table, thermal lined curtains, kitchen utensils, pots & pans and a chilli bin - All You Need For Camping! Plus the seating in the back folds down to make a genuine queen sized bed at night. There is plenty of storage underneath the seats or bed, so you will have no problem fitting packs or soft sided bags. Not certified as Self-Contained. Some models are manual and some are automatic transmission. If wanting an automatic model, please request. The JUCY Coaster is the newest camper and is younger than two years old, has a well-equipped kitchen, spacious interior and a comfy double bed. 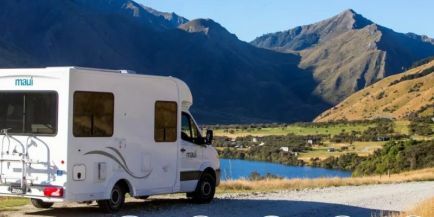 It's a super economical diesel camper which makes it perfect for an epic road trip or a weekend exploring the NZ coastline with your best friend or significant other. Certified Self Contained with a Toilet, and Grey Water Tank. Other features include: Reverse Camera, Cruise Control and Bluetooth Stereo. Seats two people.